The Story: This is what Thor and Hulk were doing during Civil War. 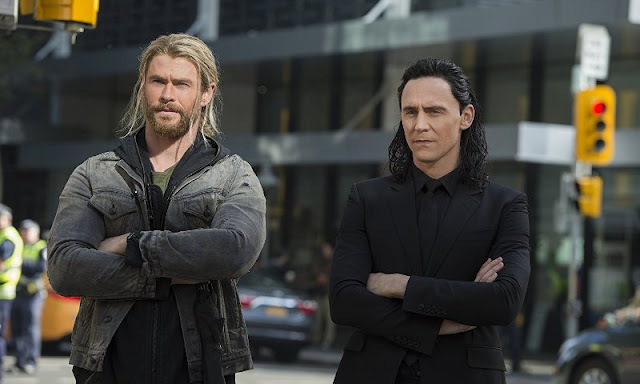 Thor: Ragnarok is officially my second favorite Thor movie and I would place it somewhere in the middle of the overall MCU pecking order. There I said it. 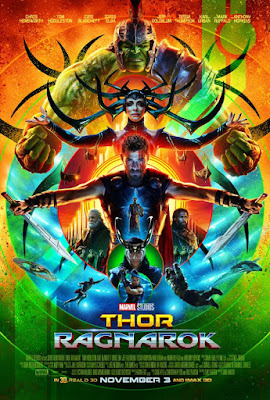 Right now, a lot of you are sitting there wondering what the heck is wrong with me because you just watched Ragnarok and you absolutely loved it and it's easily your favorite Marvel movie ever. Well, I definitely enjoyed it but, after two viewings, I have one major problem that I just can't get over and another one which I can deal with. Bear with me, this deserves explanation. When Marvel first began shaping their cinematic universe, they did a fantastic job of taking these seemingly outlandish comic book characters and placing them in a modern, realistic world that we could easily believe in. The culmination of this venture was The Avengers which had the perfect mix of character, action, ensemble, special effects, and humor. 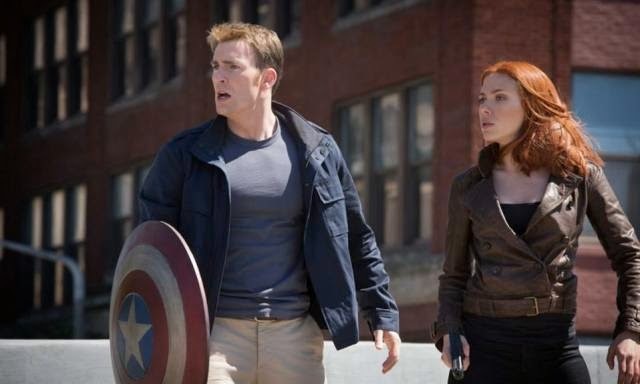 Each subsequent movie had it's own story telling style and fit nicely into established genres with the ultimate example being Captain America: The Winter Soldier, an intense, well written political thriller that just happened to feature people with super powers and extraordinary abilities and is widely viewed as the best of any MCU film to this point. Marvel's next offering was Guardians of the Galaxy which had a completely different tone, style, and color pallet and gloriously introduced us to the cosmic side of the MCU. This was a very funny and entertaining movie although it still didn't rely on comedy to tell it's story. Director James Gunn took the magic ingredients of Joss Whedon's Avengers movie and plugged them into his own while also pushing things forward but without getting too carried away. His successful Guardians sequel pushed everything further with more music, more comedy, more color, and more excess although I felt that it lost a little bit of the heart that made the first one so special. Remember that moment in The Avengers when Hulk and Thor are fighting side by side and then, out of nowhere, Hulk punches the God Of Thunder right off the screen? Absolutely, freaking brilliant, right? We couldn't get enough of that scene because it was the perfect comedic moment that reminded us to have fun while watching this fantastic adventure story. Okay, here's the point of it all. 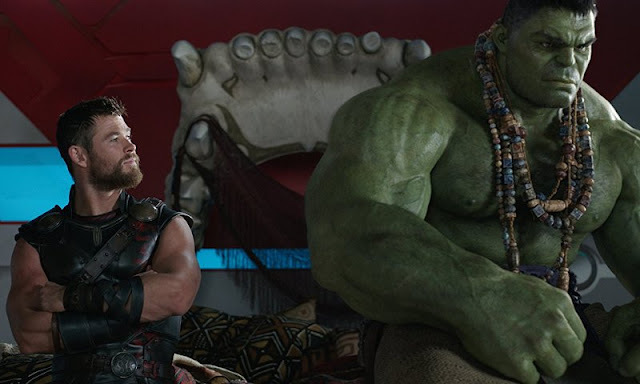 The main problem I have with Ragnarok is how it takes that moment of comedic magic and tries to plug it into every freaking part of the movie. I get it, this is billed as a comedy, but it really doesn't need to be. It can be an action adventure with moments of comedy and it would still be fantastic. Do we really need a gag every 30 seconds? Some might say yes, but to me it was way too much of a good thing and actually interfered with the story in a lot of ways. Why does this bug me as much as it does? From a story telling standpoint, comedy erases any sort of tension or danger and villains become irrelevant because you know that group of funny people you keep laughing at can't possibly fail. They're not going to fail, even when faced with one of the best villains the MCU has to offer who is being played by one of the most amazing actresses on the planet. 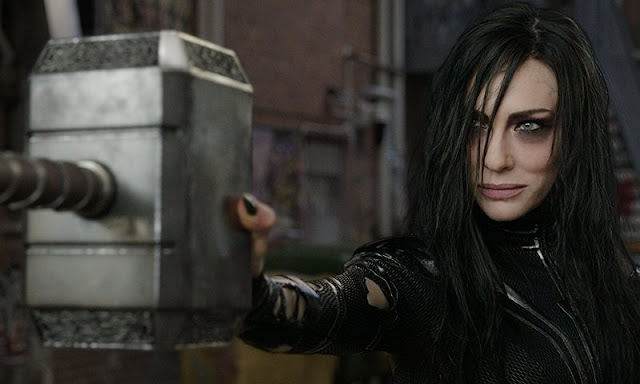 Cate Blanchett as Hela is absolutely brilliant and she crushed every moment of screen time she was given. One final complaint and then I'll tell you why this movie is so good. Why did Hela have to be Thor and Loki's sister?! Totally unnecessary!!! One major complaint people have about the MCU is that the villains are all evil versions of the hero. Hela could have broken that mold and become something transcendent but for some reason, Marvel decided to totally change her story and turn the whole thing into an awkward family drama. There's even jokes about it in the movie where people say how awkward it is. That being said, I loved Cate Blanchett as Hela and I really, really hope she is able to come back to cause more madness and mayhem. One thing Marvel does better than its competitors is casting. When the core group of Avengers was put together, Chris Hemsworth was brought in to play Thor and that was seriously the best thing ever for so many reasons just like Downey as Iron Man and Evans as Captain America. He looks like Thor and he carries himself like Thor and I can't imagine anyone else ever playing the part. He is a joy to watch on screen and pairs perfectly with Tom Hiddleston who plays Loki, the god of mischief and brother of Thor. The pair are just as good as they have ever been both together and individually on screen and it's always fun to see how their brotherly relationship progresses over the course of each movie. Mark Ruffalo doesn't really have much to do since half of his screen time is as the Hulk but he still does a fine job and successfully pushes the character forward. It was fun to have the Planet Hulk comic book story play out a little bit in Ragnarok and it will be interesting to see how the character progresses into Infinity War. 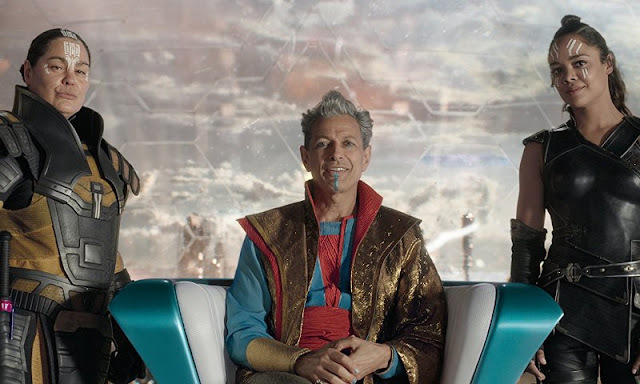 While Hulk's story is going on and Thor is doing his thing, we also get to see newcomers Jeff Goldblum as the Grand Master, Tessa Thompson as Valkyrie, and Karl Urban as Skurge to go along with Cate Blanchett as Hela. 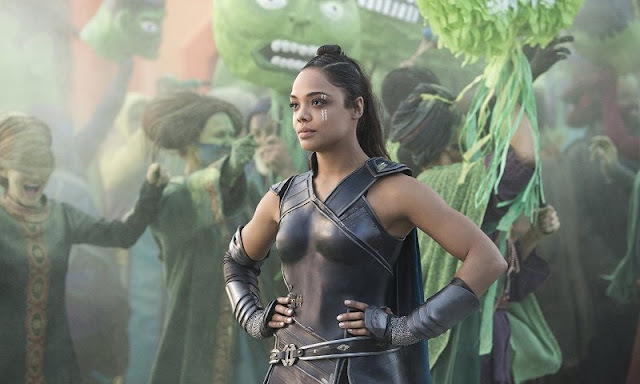 Tessa Thompson is fantastic in this movie and Valkyrie absolutely deserves to become a primary member of the MCU roster. She brings a strength and swagger that I believe is intentionally reminiscent of how we were introduced to Han Solo back in the original Star Wars. There are brief moments where we see her have a possible interest in Thor although there are also a couple nods to the fact that she has teamed up with Banner for several comic book adventures in the past as well so who knows what may happen down the road. 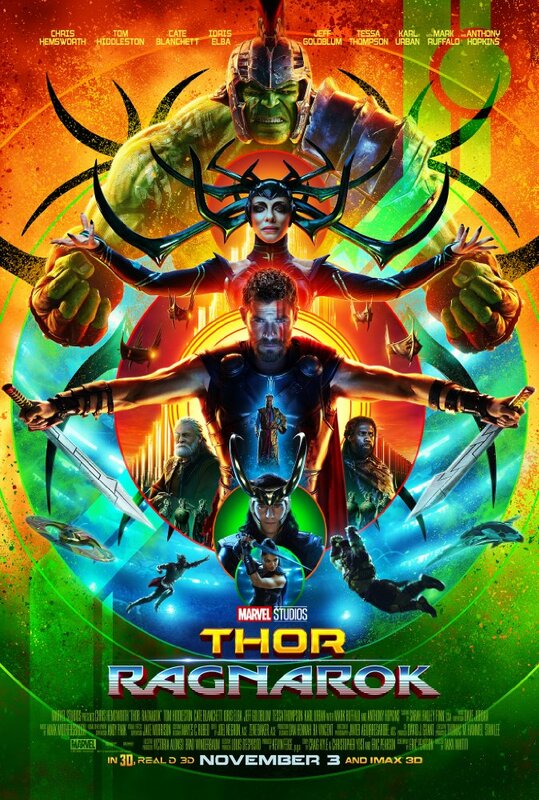 Thor: Ragnarok is a cinematic thrill ride filled with epic battles, high powered special effects, fun characters, and non stop comedy. Lots of comedy. Excessive amounts of comedy. Director Taika Waititi gives us more of the cosmic side of the MCU by showing us what Thor and Hulk were up to while a Civil War was taking place on Earth. While in some ways this movie was an exercise in excess, it still entertains effectively and gloriously gives us a gateway to the inevitable and impending Infinity War. I did not see the movie in 3D or any other premium format like IMAX or XD. I did however see it at the Cinerama in Seattle and would highly recommend seeing it there. The presentation is just fantastic and an experience you don't want to miss out on. 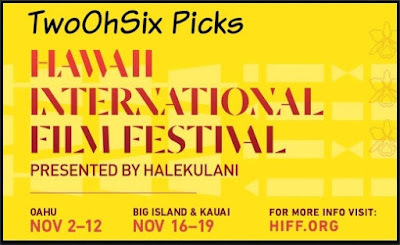 Thor: Ragnarok is being featured as a special Gala Pesentation during the 2017 Hawaii International Film Festival with director Taika Waititi in attendance.